Home Domestic News Roberto Mancini To Be Sacked By Manchester City? Rumours are starting to emerge that Roberto Mancini is to be sacked. Roberto Mancini To Be Sacked By Manchester City? 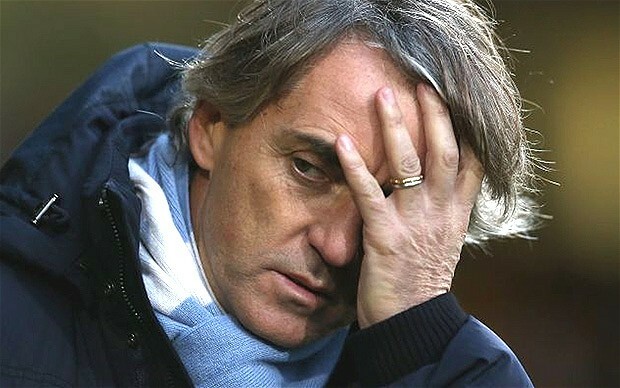 It’s not like me to partake in rumours, but I’ve started to hear whispers about the future of Roberto Mancini. I have heard that he is about to be sacked as Manchester City manager in the next 48 hours, even if he guides the club to a second FA Cup trophy in three years. I must state and restate, this is only a rumour at the moment, but I’ve heard it from someone that has no need to make up such things and has no reason to do so. It sounds very much like a game of Chinese whispers to me but I wouldn’t be doing my job if I didn’t mention it. Rumours started to circulate weeks ago once rivals Manchester United secured the title but have taken a back seat due to the announcement that Sir Alex Ferguson will be stepping down from the Old Trafford hot seat. Due to the hundreds of millions spent by City it was always going to be a tough job to avoid such rumours having surrendered their title with almost no fight this season. Sir Alex himself said he was surprised by how easily his team reclaimed their title admitting he expected a bigger challenge from the teams directly below them. City ended last season on 89 points and with only two games remaining sit on 75 points, ten points behind rivals United. Here at The Football Family we try not to deal in spurious rumours but we are desperate to hear what you think. Have you heard similar rumours? Have you heard something that would completely rubbish these reports? You can leave your comments below or contact us on twitter.